ACADIA NATIONAL PARK, Maine — With milder winters sparking a surge in deer ticks, park rangers now duct-tape their ankles while combing the wilds of Acadia, where native flowers are disappearing at alarming rates and invasive species are thriving. Along the rocky coast of Georgetown, Maine, lobstermen are finding more black sea bass in their traps, spiny intruders that until recently were almost never spotted so far north. In a pond in Brunswick, an increasingly prevalent disease has ravaged amphibians. In a state with the highest percentage of forested land and a long, famously scenic coastline, where timber and fisheries remain at the heart of the economy, climate change has become an immediate concern. 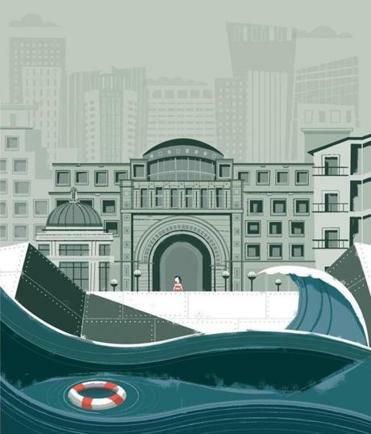 Heat waves, more powerful storms, and rising seas are increasingly transforming Maine — effects that most climate scientists trace to greenhouse gases warming the planet. Wedged between powerful streams of cold and warm air, the state is buffeted by climate fluctuations in the arctic and the Gulf of Maine, both of which are warming rapidly. Over the past 100 years, temperatures throughout the Northeast have risen by about 2 degrees Fahrenheit, according to a federal report released this year known as the National Climate Assessment. Precipitation has increased by more than 10 percent, with the worst storms bringing significantly more rain and snow. And sea levels have climbed by a foot. A study by the Gulf of Maine Research Institute this year found that coastal waters are warming at a rate faster than 99 percent of the world’s other oceans. Five things the city is doing now, and five more things it ought to be doing. Maine, scientists say, is uniquely vulnerable. The National Climate Assessment’s predictions for the future are grim: Temperatures are projected to continue their rise, up by as much as 10 degrees by the end of the century. Sea levels could increase as much as 4 feet. Storms will likely grow in intensity, while heat-related deaths in a state where much of the population is elderly and lacks air conditioning are expected to climb as well. Some benefits may come with these trends — a longer growing season, more tourists drawn to the state’s coast and other attractions by generally more temperate weather. And not all experts accept the specifics of the forecast — some call the estimates alarmist; others, too cautious. But the scientific consensus is growing. Some of Maine’s natural marvels will soon feel the impact of climate change. Or they already have. Moose are coping with more tick-borne diseases. Puffins are at risk as their prey, such as herring, dwindle and move further north. Lobster and clams are suffering shell disease that has been linked to the acidification of coastal waters. The warning signs are getting harder to ignore. In Brunswick last year, Nat Thoreau Wheelwright waded into his backyard pond for a swim and noticed something more disturbing than the usual bounty of slithering leeches. Thousands upon thousands of tadpoles — clumps of them floating or mired in the bottom murk — had died overnight. “It was like an entire city had been wiped out,” he said. A day before, Wheelwright, chairman of the biology department at Bowdoin College, had noticed a thriving population of the wood frog tadpoles flitting through the copper water, which he monitors as vigilantly as his namesake observed Walden. He estimated that more than 200,000 tadpoles had died within 21 hours — which would make it the largest, most rapid mass death of amphibians ever reported in academic literature, he said. Was it a strange but very localized catastrophe, or a kind of alarm bell? Wheelwright set out to find out. He sent several of the bloated tadpoles to colleagues at the University of Tennessee, who confirmed his suspicions through DNA analysis. They had died as the result of ranavirus, a disease that scientists say is a leading reason why 1 in 3 amphibians around the world are at risk of extinction. It was the second known account of a die-off in Maine associated with ranavirus. The disease has thrived and moved north with the milder winters of recent years and the spread of invasive species, devastation that Wheelwright and colleagues described this summer in the journal Herpetological Review. Wood frogs are among the most abundant amphibians in North America, so there’s little risk of the species’ extinction anytime soon. But with highly permeable skin that makes them vulnerable to toxins in the environment, amphibians are considered a harbinger of climate change. The mass deaths of amphibians, which have been reported in Asia, Europe, and South America, signal danger to other animals and plants. “Amphibians are the most imperiled group of animals on the planet and are the sentinels for environmental change,” said Matthew J. Gray, a professor of wildlife ecology at the University of Tennessee in Knoxville and a coauthor of the report. Ranavirus has been found in vernal pools as far north as New Brunswick, Canada, and there was a report more than a decade ago of a smaller die-off as a result of the disease in Acadia National Park. But the massive number of dead tadpoles that Wheelwright documented in his pond showed for the first time the lethal speed and danger of ranavirus to large populations of amphibians, the ecologists said. 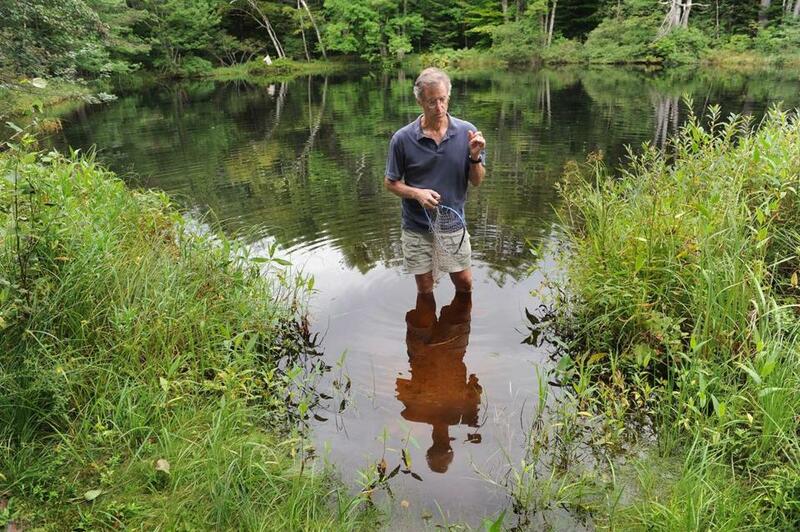 Bowdoin College biology professor Nat Wheelwright looked for frogs by his backyard pond in Brunswick, Maine, where earlier this summer an estimated 200,000 wood frog tadpoles died in less than a day. The tadpoles tested positive for ranavirus. A range of other amphibians continued to thrive through the die-off, including newts, salamanders, and bullfrogs. That suggested the mass death of tadpoles in the pond, which lacks predators such as fish, wasn’t exacerbated by human contamination or some other pathogen, Wheelwright and others said. “If this is indicative of what’s happening in nature, it’s really concerning,” said Tom Waltzek, co-director of the Aquatic Animal Health Program at the University of Florida in Gainesville, who represents North America on the board of the Global Ranavirus Consortium. The potential risk goes beyond the immediate die-off: Repeated exposure to ranavirus could have major consequences for a the wider population of a species. In a separate study, Gray found that an exposed population of wood frogs could disappear in as few as five years if its larvae — tadpoles — are subjected to the disease every year. Derek Yorks, a wildlife biologist at the Maine Department of Inland Fisheries and Wildlife, now sterilizes his shoes and equipment to avoid spreading the disease. He and his colleagues are increasingly hearing about ranavirus in Maine, but he said the effects are hard to track. The dead disappear within hours. “They get gobbled up or decompose really quickly,” Yorks said. In Wheelwright’s pond, wood frogs returned this spring, but there were no 1-year-old frogs breeding and fewer tadpoles. But the population, he fears, could eventually wither away entirely — a deeply disturbing prospect for the biologist, who for decades has eagerly anticipated their intense mating calls, which signal the end of the long winter. 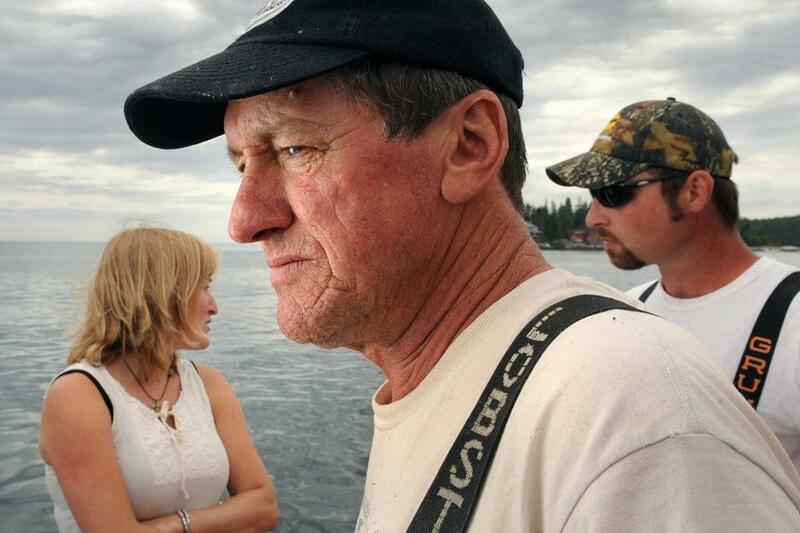 On Sheepscot Bay off Georgetown, Jim McMahan prodded his old lobster boat through the smooth waters, methodically lowering a mechanical winch to check on his hundreds of traps. The 57-year-old lobsterman, who has been hauling up the rusty cages since he was a kid, manages to make a living from the still-plentiful shellfish in local waters. But he has noticed some disturbing trends in recent years. Nearly every day now, he pulls up scores of lobsters with diseased shells. “Until six or so years ago, we would never see that,” he said between hauls this summer. State biologists last year reported that the number of lobsters with the mottled, lesioned shells caught in Maine increased fivefold from 2010 to 2012. Warmer waters promote the bacteria that cause the disease. Moreover, the increasing amount of carbon dioxide in the atmosphere that is absorbed by the warming ocean has produced more carbonic acid, making it harder for lobsters to build their shells and increasing their vulnerability to the bacteria, scientists say. The lobster catch is, nevertheless, still booming. Last year, the state’s fishermen caught a record $364 million worth of lobster, $22 million more than in 2012, according to the state’s Department of Marine Resources. The warmer waters have likely benefited lobster growth and propagation in recent years, but scientists worry that as coastal waters continue to heat up, the lobster could follow the path of cod, which thrive in colder waters and are vanishing from the Gulf of Maine. An assessment this summer by the National Oceanic and Atmospheric Administration estimated that the region’s cod have dwindled to as little as 3 percent of what it would take to sustain a healthy population. Another concern is the arrival of new, aggressive predators from the south. In recent years, McMahan and other fishermen here have discovered an increasing number of black sea bass in their traps. “We didn’t have any idea what they were when we first started catching them,” said Chris Jamison, McMahan’s deckhand. The sea bass, which have a distinctive black stripe visible underwater, have been creeping up the coast from their traditional home in the mid-Atlantic. They could prove to be a lucrative market for local fishermen, but they eat a lot of crustaceans, including baby lobsters. Concerns about the future of lobsters, which account for three-quarters of the value of Maine’s fishery, led McMahan’s daughter, Marissa, a doctoral student in marine sciences at Northeastern University, to base her dissertation on the northward migration of black sea bass. Over the past few years, she has collected an increasing number of black sea bass that local lobstermen found in their traps, with hopes of better documenting their movement. There is little rigorous data on sea bass in Maine, but scientists are now paying attention to their numbers. “There is concern that they and other predatory fish from the south could impact the lobster population,” said Andrew J. Pershing, chief scientific officer at the Gulf of Maine Research Institute. The state has also taken note of the new arrival. Last month for the first time, Maine fishery officials proposed regulations to manage recreational and commercial fishing of black sea bass, allowing a modest catch of nearly 11,000 pounds a year, in hopes of assessing the costs and benefits of the emerging fishery. At the dock in Georgetown, local lobstermen had mixed feelings about black sea bass, which have brought better prices than lobster in recent years. Jim McMahan of Georgetown, Maine, says he’s not yet concerned about sea bass that are often in his lobster traps. His daughter, Marissa (left), is researching sea bass for her dissertation. At right was sternman Chris Jamison. On a balmy morning last month in the woods on Mount Desert Island, Abe Miller-Rushing poked through the bramble until he found a sprawling shrub called Morrow’s honeysuckle, which has been displacing native plants since it arrived from East Asia in the 1800s. “This is one of the reasons why we’re losing diversity here,” said Miller-Rushing, the science coordinator at Acadia National Park, which now spends more than $200,000 a year to manage all the invasive plants. Nonnative shrubs and wildflowers such as purple loosestrife, glossy buckthorn, and barberry are spreading in the park, while native flora such as orchids, asters, and lilies are disappearing. Over the past century, as warmer, wetter weather allows plants from the south to thrive here, about 30 percent of the park’s 500 wildflower species have declined in abundance, and 92 species have disappeared, according to new research. One study found that native trees such as fir, spruce, aspen, and paper birch — about 16 percent of 83 species of trees in the park — are also facing significant declines or are at risk of disappearing from Acadia. Other trees more common further south, such as hickory and various species of oak and pine, may in time displace them. With an average year at the park now warmer than all but a few of the hottest years over the past century, with birds like the black-capped chickadee, Maine’s state bird, moving away to the north, and the increasing erosion of its iconic craggy coast, Acadia is experiencing a greater impact from climate change than nearly every other national park, Miller-Rushing said. Perhaps the most tangible human impact is a surge in Lyme disease, as more ticks survive the winter. More than a dozen of the park’s 250 rangers have contracted tick-borne diseases in the past five years, Miller-Rushing said, leading rangers to take precautions like taping their pants to their boots. “This is not glamorous; in fact, it looks downright goofy,” said Anthony Tocci, who oversees management of invasive plants. “But it works. Last year, Maine saw a record 1,377 diagnosed cases of Lyme disease, up nearly 700 percent from a decade before, according to the Maine Center for Disease Control and Prevention. Other tick-borne diseases, such as anaplasmosis and babesiosis, are proliferating at similarly alarming rates, diagnosed more often as residents become more aware of the diseases. Officials at the park, which is seeing an average of 8 more inches of annual precipitation than a century ago, said their depleted finances from steep federal budget cuts make it harder to halt the increasing toll of erosion. Culverts along the park’s historic carriage roads and hiking trails, unable to handle the storm drainage, have led to more washouts and closures. Rising seas are threatening salt marshes as well as 5,000-year-old native American archeological sites called shell middens. “A huge task for the park is to try . . . to meet increased flows and to try to plan for the unknown — what the future under climate change may look like,” said Rebecca Cole-Will, chief of resource management at Acadia. For Caitlin McDonough MacKenzie, a doctoral student in biology at Boston University, the park’s threatened future is visible in the present. Her research has found that plant species are disappearing uniformly throughout the park — in wetlands, grasslands, and forests — and that earlier thaws have allowed shrubs sensitive to temperature, such as Morrow’s honeysuckle, to bloom earlier and displace those that grow on a time cycle. Last year, she began testing how low-bush blueberries, sheep’s laurel, and three-toothed cinquefoil grow at different elevations on Cadillac Mountain. She has found those at lower elevations, where it’s warmer, are blooming more quickly. Her ultimate concern is that as plants bloom earlier, they may no longer remain in sync with the bees that pollinate them and could become more susceptible to large die-offs from late frosts. She worries that in coming decades she won’t recognize the Acadia she knew as a child.